Based on our classic design that’s won rave reviews from customers for years, but with a new high-domed cover that adds capacity and doubles as a serving bowl. No oil needed. It’s the quick and healthy way to make popcorn! • Before initial use and after subsequent uses, hand wash with warm, soapy water. • For microwave and storage use only. 1. 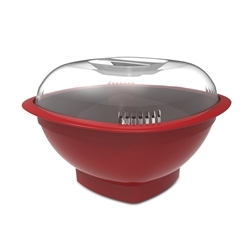 The use of oil is optional, but not necessary with our popcorn popper. If using oil, place 1-2 Tbsp of oil into the base of the popper. Add what you want and it’s so cost effective! Yay! Not a fortune to have a healthy snack!